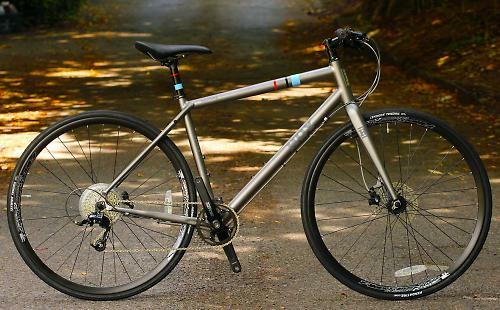 Hoy's Shizuoka is a fast, fuss-free flat handlebar road bike with hydraulic disc brakes, 10 gears plus room for bigger tyres, mudguards and a rack that makes it both very adapatable and upgradeable too. Every bicycle company product manager has to juggle compromises of ideals when it comes to putting a genre tag on a bike like this. The 'hybrid' label has never really had a strong sales pull but Hoy's 'city' category isn't that great either, as the Shizuoka is far more than just a city bike. The problem is that 'flat handlebar road bike' doesn't quite hit the spot either. The good news is that this has the potential to be a great bike for a lot of different riders on a lot of different types of terrain. However you choose to categorise it, we concluded that £620 is a pretty good deal for a bike that can comfortably roll out one of our favourite relatively hilly 30km road loops at just a single kilometre per hour slower than a regular drop bar road bike costing about twice as much. Okay, it wasn't a scientific test and there might have been other minor variables, but you get the idea. Tipping scales at just under 10.5kilos/23.3lb the Shizuoka is about the same weight as many sub £1000 competition-bred road bikes and about three kilos lighter than the sort of mountain bike that many urban riders are seduced into buying for this sort of price. And for the benefit of those who might have been tempted by a mountain bike or suspension assisted but budget stifled hybrid for pot hole addled urban blacktop there's plenty room to fit fatter, more shock friendly 700c tyres if you feel the need, as well as rack and mudguard bosses and two sets of bottle cage bosses. 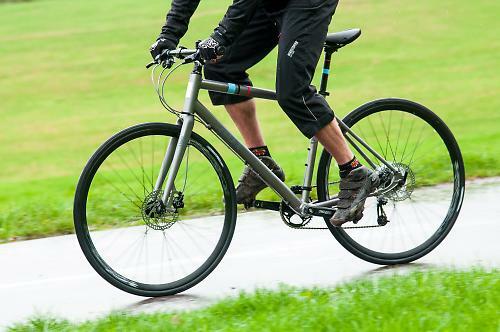 The Shizuoka is essentially a much faster lighter option than the many hybrid or MTB alternatives that make their presence felt in the market around £600. It readily lends itself to longer road rides and, with very little adaption, to much more expansive outings and occasional trail use, although there will certainly be riders who'll want to upgrade to double or triple rings up front for long hilly road rides. The cable guides are already there so all you need is a front gear mech, shifter and an appropriate crankset: the crankset fitted would allow two rings but you'd need a new crankset if you wanted a triple. 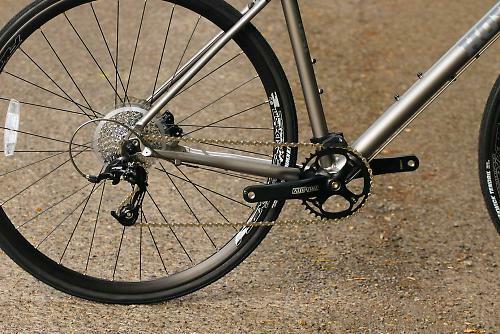 SRAM's 1 x 10 X5 based drivetrain keeps things simple and clutter free for urban use and the 38 chainring and 13-32 cassette should suit most riders for urban and occasional rural use. But there'll be those who'll wish for bigger or smaller gears. There are some obvious alternatives to the 002 model within the Hoy range. A £900 Shizuoka 004 and a £750 003 both have 50/34 cranksets, or there's a £550 001, still with hydraulic disc brakes but with only eight gears. 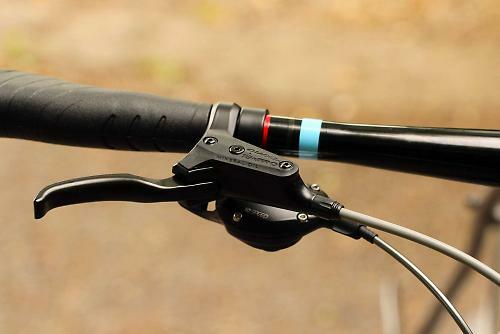 Apart from its flat handlebar, the Shizuoka 002's most distinctive selling point to many riders will be the Tektro hydraulic disc brakes, which have a powerful and well modulated action, a light lever feel and equally predictable stopping performance in wet or dry conditions. They need a few long braking sessions on the first ride though, to heat and glaze the pads before they offer optimum stopping power. The Hoy marketing spiel describes the Shizuoka 002 as 'a fast, efficient and comfortable ride, combining the speed and efficiency of a road bike with the rugged durability of a mountain bike'. We wouldn't go that far. 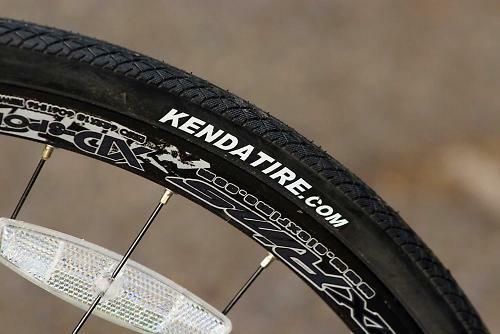 The 28mm Kenda Kwik Tendril tyres emphasise rolling speed rather than off road traction, shock absorption and durability, but there's lots of frame and fork room around them and we comfortably slotted in a pair of wheels with 38mm treads, with room to spare. 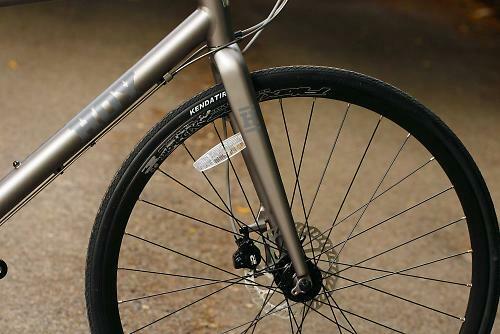 The tyres, the deep rims and the stiff aluminium frame certainly won't offer any favours for your comfort if you venture off the smooth blacktop so we'd imagine a lot of riders would eventually fit fatter tyres. But its also the wheels and frame as they are that combine to produce such sprightly handling, quick acceleration and easy climbing. 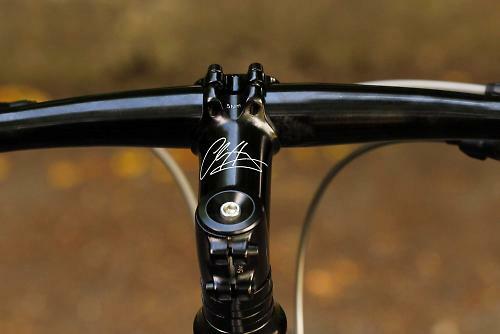 The fine detail on the frame is relatively straight forward, about average for a £620 bike. The 6061 aluminium tubes are triple butted to extract weight and add a degree of compliance when roads get rough. Double-pass welds give a smooth appearance and the flat grey colour scheme is very subtle, almost to the point of anonymity, no bad thing on an urban bike. The tubes are ovalised and shaped where functionally useful but there's no superfluous hydroforming and the 72 degree head, 74 degree seat, 23in top tube reach geometry (on a medium size) is ideal for fast leisure riding. Cable routing is tidy, there's loads of bar, stem and saddle adjustment potential and an integrated headset gives a very tidy front end look that flatters the no-fuss aesthetics of the disc brake approach on the forks and seat stays. The only problem we had was with the minimalist lightweight seat clamp, which broke half way through the second ride. The seat post was a fairly loose fit in the frame so we had to over-tighten the clamp to hold it tight. We know that's why it broke so it needs to be more substantial if the post/tube tolerances are so loose. Other aspects of the fine detail were spot on. 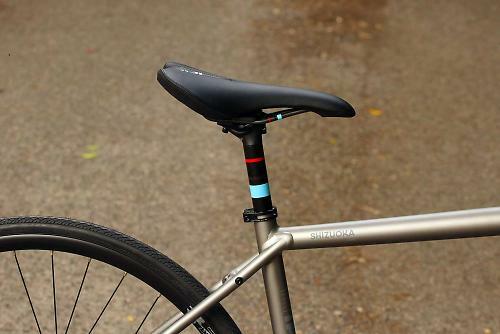 The gear cables have frame-rub-protection donuts around the head tube, the bar grips are bolted and ergonomically shaped, the saddle has tough Kevlar edges and the rims are slightly wider than average so that they can comfortably take a wider set of treads if needed. 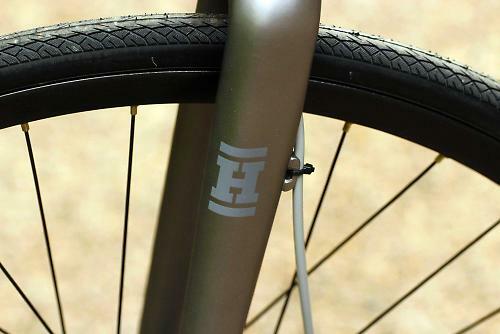 The 25in wide flat bar, stem, saddle and double bolt seat post are all decent quality Hoy brand offerings and there's a little chain guide fitted to prevent the chain dropping on bumpy terrain. 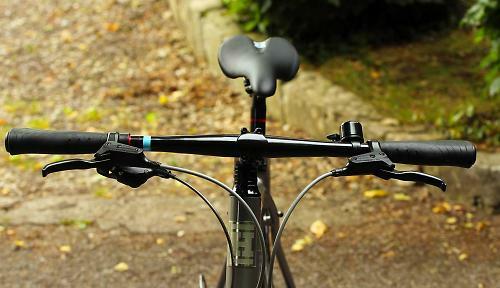 In terms of fit the standover room is generous and the reach from saddle to handlebar is long enough to allow a comfortably efficient flat backed climbing stance. Sizes available extend from XXS, for riders from 4ft 11in, up to XL, for those up to 6ft 4in. The small sizes can't be assumed on 700c wheeled bikes. And in case you're wondering, the Shizuoka name was inspired by Hoy's time spent at a keirin school in Japan. A fast and fuss-free flat handlebar road bike with hydraulic disc brakes, ten gears and room for bigger tyres, mudguards and a rack. 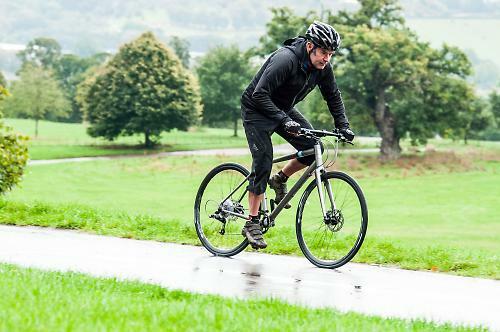 While we didn't really agree with the second part of Hoy's 'fast, efficient and comfortable ride, combining the speed and efficiency of a road bike with the rugged durability of a mountain bike', the first bit rings true. On the road it's almost as quick and lively as a thoroughbred. Off road it needs bigger tyres, but it has room for those and would double up nicely as a touring bike. Triple butted aluminium frame. 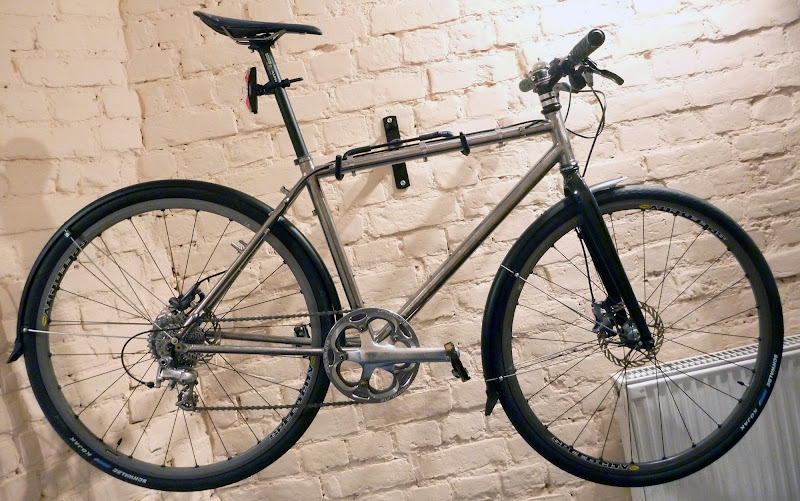 Alu fork. Smooth double pass welds. Tidily put together but not with any particular flair. Superb on the road, needs bigger tyres for more than gentle off road jaunts or for more comfort on the road. The only gripe was with the skimpy seat clamp, which needed over-tightening to hold the post tight and broke on the second ride. Lighter than many dropped bar road bikes at this price. No unexpected quirks, handled superbly, very fast on the road, needs bigger tyres if you plan to ride more than smooth trails off road. The light and lively ride, and simple gear set-up. Less than fit riders would probably prefer a double crankset up front. 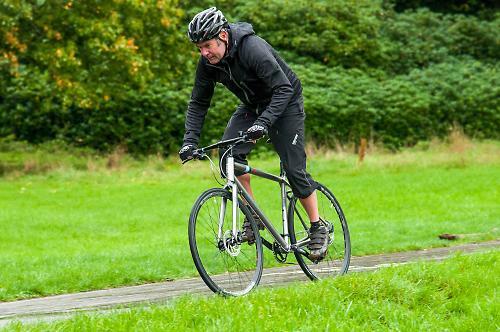 Given Sir Chris Hoy's thoroughbred racing background, it's great to see him putting his name to, and campaigning for, bikes for use as transport as well as sport. Interesting I'd consider one with a compact crank . I reckon this bike has the potential to be brilliant. Now wide-ranging 10 and 11-speed cassettes are available, there's no need to carry the weight of a front derailleur - no need to maintain one either. 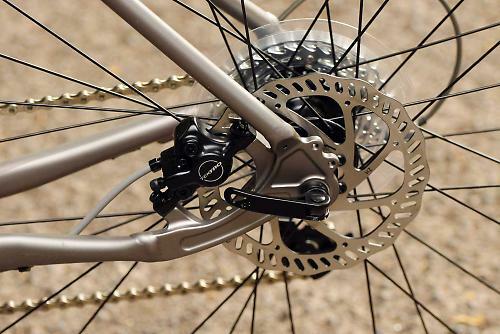 The 38x32 bottom gear is the same ratio as the 34x28 on my road bike; for a novice rider I'd be tempted to swap it for the 11x36 SRAM MTB cassette and then it would be able to climb walls, and go a little bit faster at the top end. Went from 3x9 to single 40t x9 on my hybrid commuter 18mnths ago, no regrets, one less mech/cable to maintain in the winter, the way forward if you've no big hills to contend with. Most folks who talk about buying their first bike for a while think they need a mountain bike for urban cycling, when in fact this is exactly what they need. I have become a big fan of this type of city bikes since I got mine. It is simple to use and maintain with low enough weight to carry upstairs. Ti frame, Mavic Speed City wheels with Conti Speed RIDE 35X700, Alu fork to save cost, 50/11-32 to save weight... all in all 10,5 kg (with mudguards & lights).